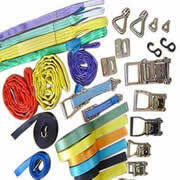 Extremely quick and efficient tie down and release of load thus saving time. No damage to the load being tied down. Available in almost unlimited configurations and combinations. Both hooks swivel 360 degrees. Each binder individually proof tested. Short reach hooks for maximum take-up. 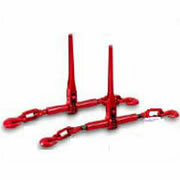 We supply many makes of load restraint and can repair, service and test all makes in our workshop.